Douthat thinks that that’s mainstream and that Hollywood is fully behind it, but it’s really still the insurgent religion to muscular Christianity and militarist nationalism. This is one of the rare films in which the Goddess (Mother Nature & the Natives) takes on the Capitalist War Machine and… well, you’ll have to see who wins. The good white boy messianically leads the natives in rebellion against their overlord invaders — which makes it Christmassy in more ways than Douthat’s Solstice-timed op-ed suggests. 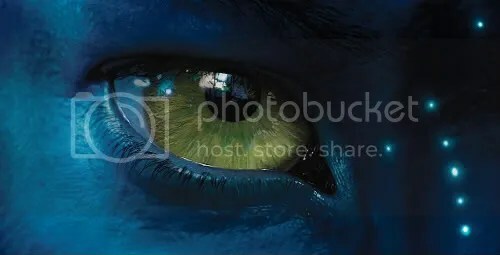 The Na’vi and their planet, Pandora (Pan-Thea, the tree-forest-rhizome-neural-network Goddess and World Soul, Pandora whose box, when opened, unleashed a million megatons of reality on humanity — it’s pagan mythology with a sledgehammer; gotta love it). The ethnographic theme — the translation/mediation between two opposed cultural worlds, science and anthropology’s dependence and ultimate answerability only to empire/colonialism/militarism, and the cultural intermediary’s desire to go native, is overly stereotypical but, for the Hollywood thriller format, not badly done. It will propagate the gone-to-Croatan meme for a new generation. Ideology: Behind it all is the Spielberg factor, i.e., that the overt message (‘Man vs. Nature’, or rather high-modernist techno-capitalism vs. Body-Shop-nature-tech) is undercut by the implicit message that it is science, technology, and Hollywood magic — the Image Industry, the Spectacle — that enchants us and brings us what we really want. And they bring us new life, maybe eternal life, through the New Age science of neuro-energetics, gene-splicing, virtual-reality, and all the rest. ‘Jake Sully’ the Na’vi avatar (not the marine) is, after all, a zombie: his body is a remote-controlled, genetically-engineered robot. As you can tell from my original review, yes, the film is loaded. And I really like many of the features Adrian brings out. It is a smörgåsbord for anyone seeking to make a symptomatic reading of either the film or, via its achievement, our society. One can pick and choose any number of dishes and fill your ideological/critical plate. I can’t really address the first two of Adrian’s points other than to say that the contradiction between the two forms of Christianity and whiteness perhaps performs a framework for what becomes an absolute and aesthetic multiplicity. I say “a” framework, and not “the” framework, because I sense that there is a narratological overload that Cameron’s film is operating by, one which can be dichotomized in any number of mapped directions. The counter stories that are embedded in their very lamination, our mythological heritage (which for moderns is made up of cinema), they bristle almost with fracticality underneath as stereotypes wrestle with becoming archetypes, becoming, more importantly. allegorious beings. There is in this film a cartological confusion, as if satellite images all selecting out different features of a landscape were layered confusedly upon each other, combined with some hand-drawn maps of significance, and then animately shuffled through, to expose the alter of our world. The very impacted yet temporally spaced nature of the plot features, perhaps inspired by video-game modulation, serves both as our disorientated potential for renewal, and hone’s our ideologically trained animal-like senses into expert tracking and thus, directed experience. (We scent THIS ground, like an idealized native american hunter, noticing every twig snapped.) This is our land. I am mostly interested in the last three points: going native, going zombie and going goddess. It is correct I think to mark out the “remote control” aspects of these plot features, it is worth pointing out that the war-machine also had remote-control experiences which extended itself out into environments. It is more the case that if Pandora represents a battleground of a kinds, it is one of a race to seal the breach which is implied in the “remote” in remote control. It is a story of connectivity conducted under a technological matrix which imposes upon its viewer the very conditions under contest narratively. Oddly enough it puts the viewer ecstatically and epistemologically in something of the moral (I want to say, but am not allowed to) position of actant in an enhanced world. What do I mean by this? Spinoza says that when we regard something to be “like” us we become affected with whatever it is experiencing. This is a primarily feature of the aesthetic experience, and I would say groundwork for how we know anything about the world at all. Thus there is something to the alien experience. That is, the dis-embodiment of environments that propels the mind further, tendrilling our knowledge out like so many Pandorean root-synapes, to similarities. 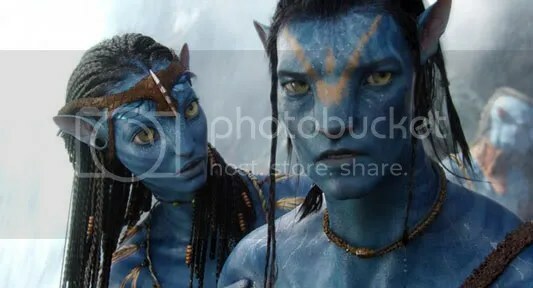 Avatarship is a primary relationship to the world, and as such requires the fundamental plot point of the film, that we must be able to become our avatars, and not just inhabit them. We must recognize our bodies in them, not reflexively as if glancing in the ideological mirror, but kinesthetically, mutually. As I have pointed out in the comments section to Adrian’s post, Cameron spent seven years scuba diving after the wealth the film Titanic brought him. One can easily recognized the diving features of the film, in particular when Sully first playfully and childishly smacks luminescence to stimulate it. A junior diver is the one that touches everything (often killing it to some degree). But it is not the portrayal of diving that Cameron was after, I suggest. 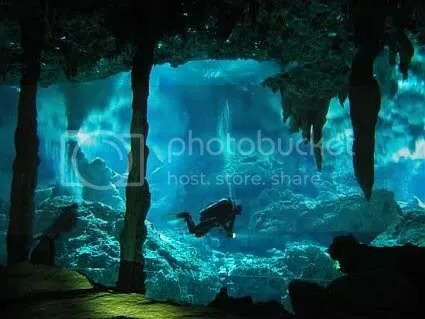 It was the kinesthetic transferral, the displacement, the suspension, the alien drift, the wobbly wonder that bombards a diver, no matter how experienced. When every single living thing in an environment is physiologically superior to you. When every single living thing is aesthetically more beautiful. When your own suspension is technological and precarious before what can only be called a witnessing. The effect is ecological. Not in any ideological sense, but in a theorein manner. The spectacle is not remote, it attaches with all the physicality as the Na’vi attatches to its ride animal. It is an over-sense. I think that this is a message in the construction of this film. Indeed the ideological and plot-character layerings work to dis-fuse the viewer in any number of directions, sending her or him into sweet spots of recognized cover, core inter-relation. But this is only a means for the potential to remove the “remote” in remote control. To assume the avatarship of one’s life. For this reason the racial component is an interesting aspect of the plot telling. There certainly is a “white” amid the ethnicity (and animality). But I think we should be careful not to polarize this into an essential binary (there is a “male” as well, and also a “class”). Instead what the experiments of technological achievement suggested by the film imply is something of the order that anatomy IS destiny, or rather, anatomy is possibility. Sully must take on the anatomy of another species in order to perform their world. Ultimately though, our anatomy is our technology (and not just our signification). Our bodies are made of the fibres, and switches, and tempos of all that extends us into the world. “White” is simply that which consciously refuses this dis-location as a mode of its own affect control. In this way there can be said to be something “white” in the Na’vi as well. We must transmute our anatomies before the alien of the world. For those viewers that granted innocence to the film, Cameron already has performed a first transmutation. And sometimes those who have not logged hundreds of hours in the technology are better suited for the avatarship. Thanks Tim, interesting reading. I voiced my disagreement with it in the comments section over there.